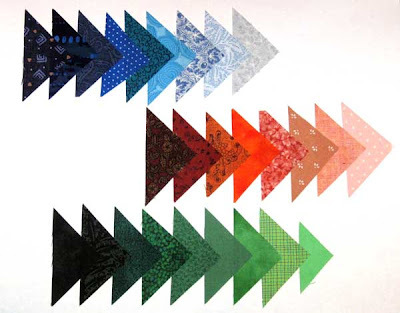 In quilting, value—the lightness or darkness of a color—is often more critical to the success of a quilt's design than color. If you've ever seen a scrap quilt with a design that just sparkles, you know that it's all about value. I'll be presenting the program, "Identifying Value in Color," at my quilt guild next Monday, May 16. My guild, the Choo Choo Quilters, is devoting the 2011 year to the study of design in quilting. We're using Lorraine Torrence's book, Fearless Design for Every Quilter, as our text. :: Choose 1 light fabric, 1 medium fabric and 1 dark fabric. :: From each fabric, cut four 4” x 5” rectangles. :: Pin the rectangles together into 6 pairs, keeping the same fabrics together. :: Make two stacks with a light, a medium, and a dark pair in each (two stacks with 6 fabric pieces in each). Bring these stacks to the meeting. :: Bring a value finder, reducing glass or peep hole or your sunglasses to the meeting. These are the leftover bits from my visuals... arranged from dark to light. You're invited to the meeting if you want to play along. Be sure to bring your sunglasses!